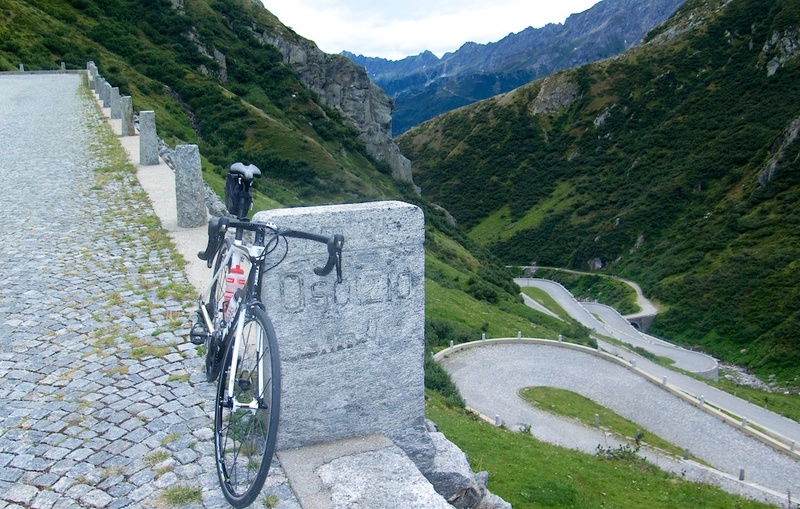 The old cobbled Tremola road up the south side of Passo San Gottardo (Gotthardpass in German) is one of the truly special high Alps climbs for cyclists. The pass has for centuries been one of the busiest routes linking the north (German speaking) and south (Italian speaking) side of the Alps. The 13th century hospice (rebuilt several times) is still at the summit. The first wheeled carriage crossed the pass in 1775. The south side climbs up the Tremola or Trembling valley. View from inside the Galleria (tunnel) descending on the main road. Fortunately, there are four ways across/under the pass, keeping traffic light on the cycling route. A 15 kilometre train tunnel opened in the 1880’s. A 17 kilometre road tunnel (no bikes!) that perpetually causes huge traffic jams on both sides of the pass. A good quality road that goes over the pass, used by trucks. I descended this way. Not a good option for climbing as long, long uphill tunnel, and some fast traffic. 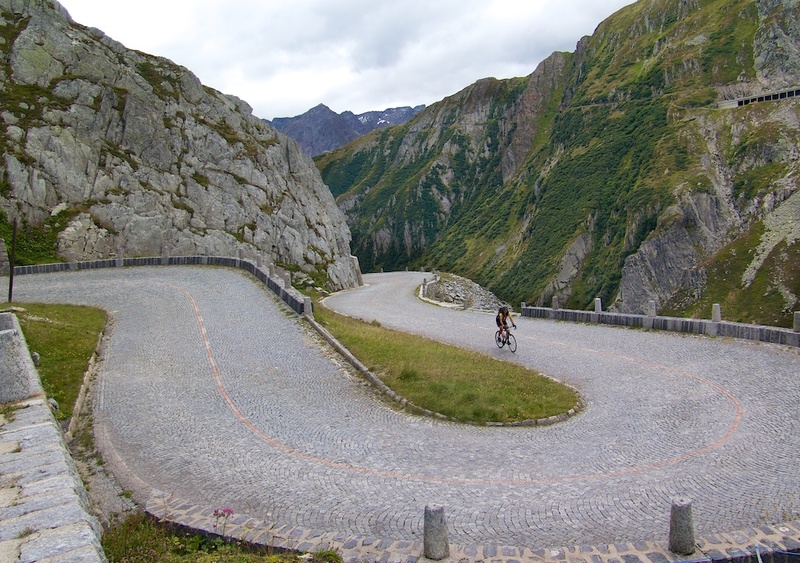 Finally, for us, the magical old Tremola road. 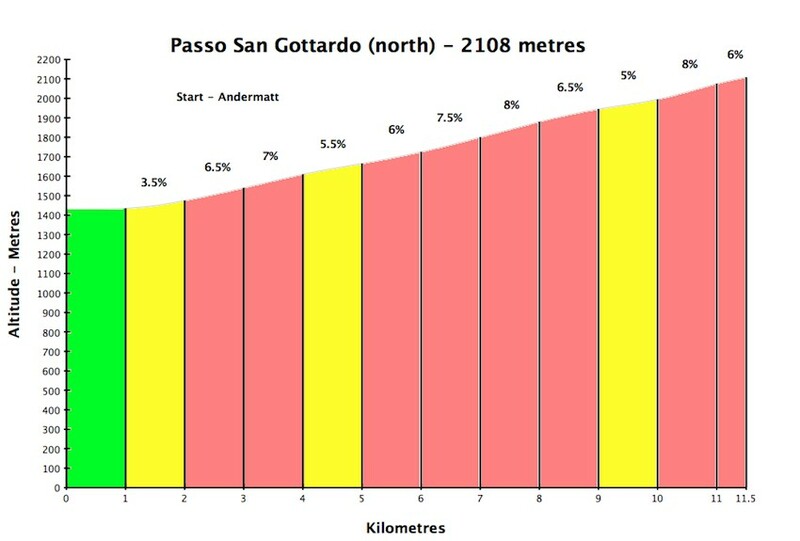 The far less interesting north side to Gotthardpass involves taking the main road, but for the last 3 kilometres one can turn off onto portions of the old road. See this blog post for a map and details. I started from Airolo, down low on the south side. 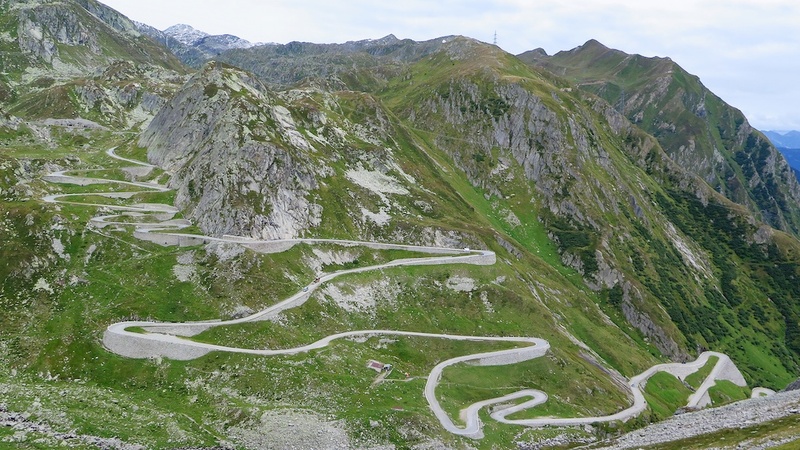 There are roads everywhere here and it can be difficult to find the start of the Tremola – make certain you have mapped this out. You want to avoid Green road signs for the pass (the tunnel), and Blue signs (main road over). Follow White signs. 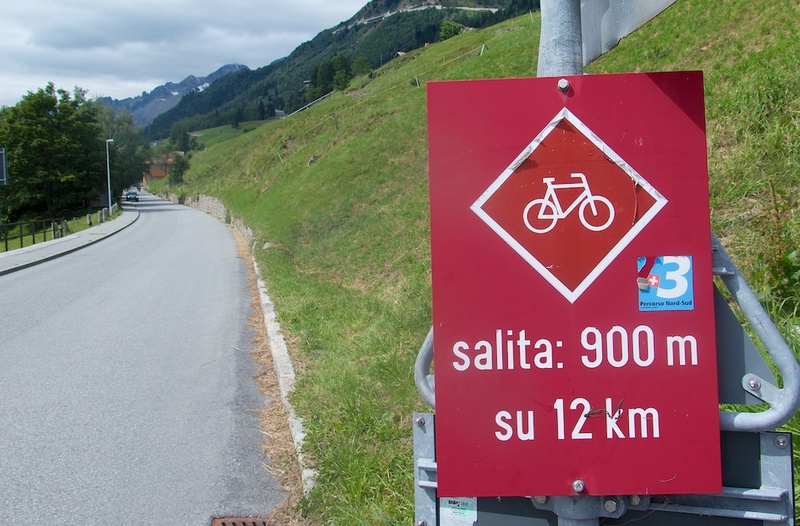 Or better: follow the the deep red Swiss National Bike Route 3 signs. The first several kilometres are generally paved, but there are several cobbled stretches. But these are nice Swiss cobbles, so not too bumpy. It’s fine going up with a road bike. The final five kilometres are completely cobbled and this is the fun stretch. Hairpin after hairpin climb through the steep Tremola valley. At the summit are three small lakes, a museum, a couple of hotels, etc. 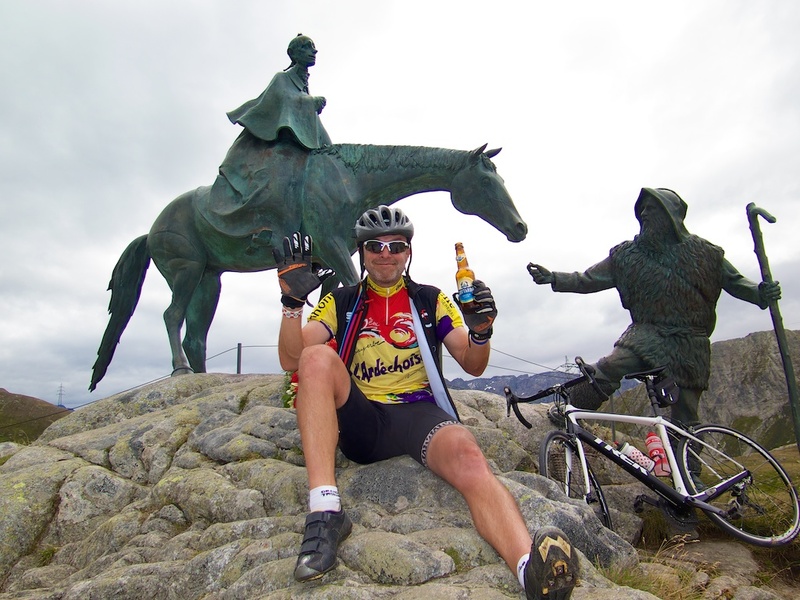 I stopped for a Gottard beer (brewed a little lower on the Ticino side), and a photo with a statue above the lake. I thought it was St. Gotthard himself, but I have since learned that it is in fact the Russian General Souvorov that crossed the pass with his army in 1799 during the Napoleonic wars. The Pass sign is perhaps a half kilometre above the lakes and buildings. From here, one can see a big dam off to the west. Most people don’t even notice it, but I like alpine dams/lakes. So I followed the good quality gravel road to the dam. To get above to the lake there is a tiny paved road, so I continued. This is the Diga (dam in Italian) del Lucendro. Lago di Lucendro is lovely. There is a good quality gravel road around the lake but I only explored a little bit of it. There is another dam/lake hidden on the west side of the pass – Lago di Sella – that I should have tried to visit as well. Next time. For the best views of the Tremola hairpins, you need to take the main road from the pass and start descending the south side. Just before the long, long galleria/tunnel is a cliff look-out (top photo and photo below). Statue to Adrien Guex. Swiss airman that crashed his plane here in 1928. Horse-drawn carriage rides available. Galleria/tunnel can be seen above. 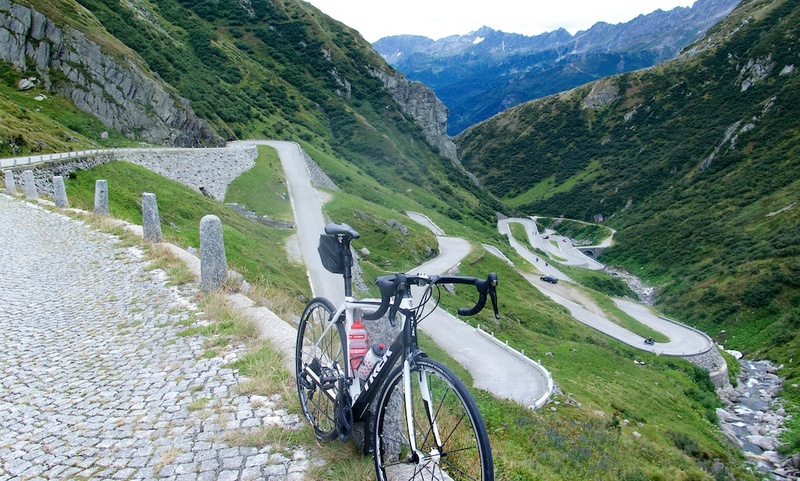 Cycling the crazy cobbled hairpins on the old Tremola road is about as good as alps cycling gets. Consider detouring to visit Lago di Lucendro. 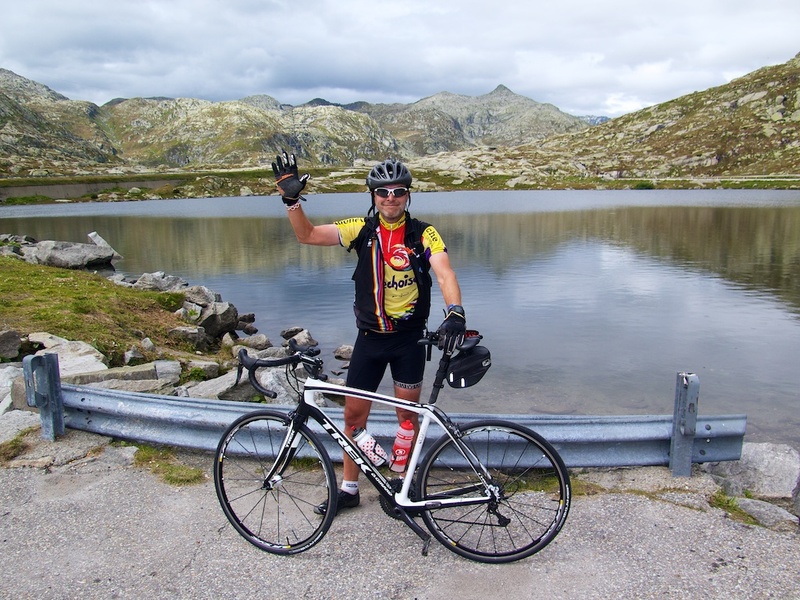 I did Saint Gotthards about a month ago as part of a loop from Airolo including Fürka and Nufenenpass. 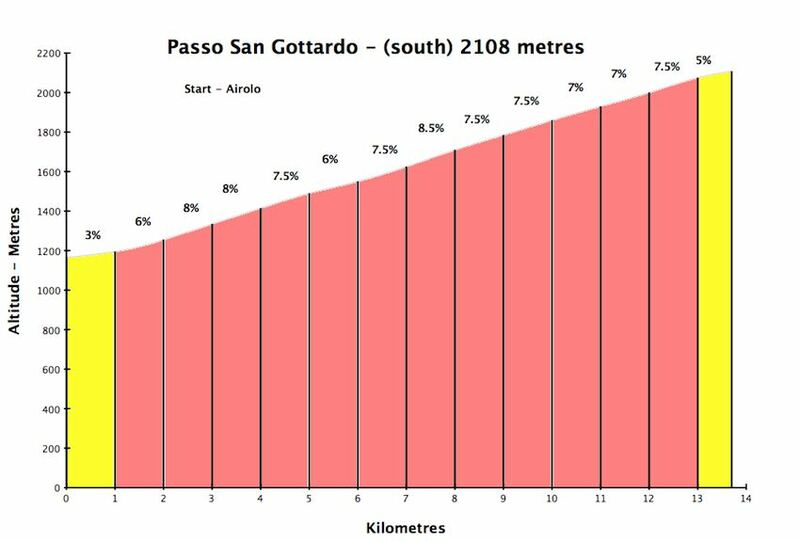 It’s now probably my favourite climb. Light traffic, tight pave, and stunning views. 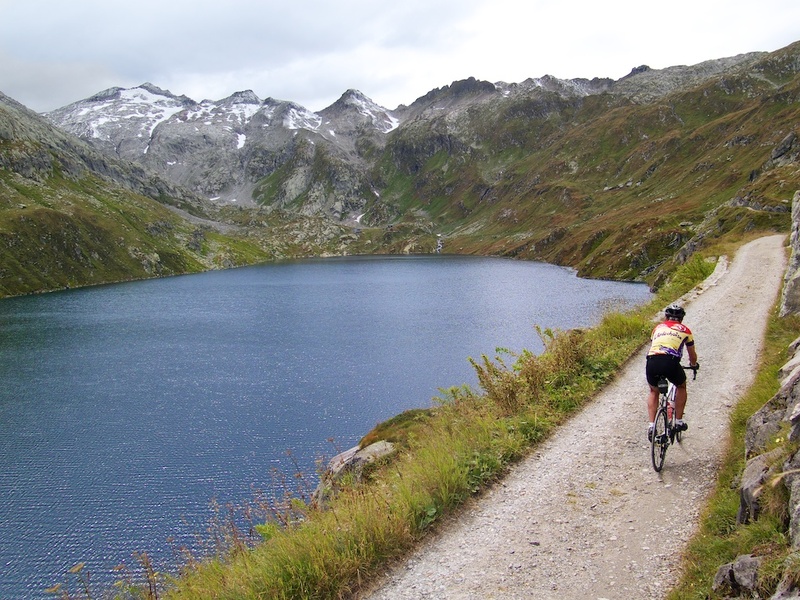 Alpine cycling doesn’t get any better. We will be using public transportation and walking, any recommendations on how to get here? Thank you so much! Awesome blog!! I assume the bus stops at the pass itself, near the restaurants and hotels. It’s not a long walk to the look-out. Look closely at a map, there is a little lake called Lago dei Banchi, a touch south of the bigger lake (Lago della Piazza) at the summit. Just south of Lago die Bianchi, just off the main (not busy) road is the view. It’s a short, safe walk. Worth it. Hope that helps. Very helpful! Thank you, Will!